When you think of housing in America, you might think of the crowded urban areas or suburbia, with houses tucked neatly in rows. This is because urban areas grow at a rate four times faster than rural spaces, and according to a new report, this won't be changing anytime soon. In fact, according to the research report The Future of Rural Housing, growth in rural America will be slowing down over the next decade. 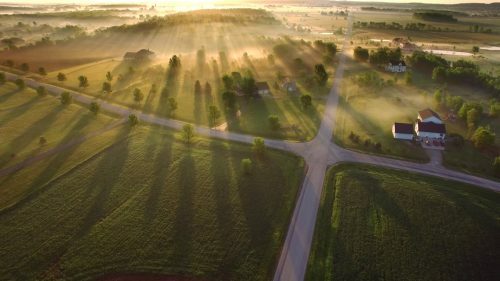 Poverty reigns in rural America, and while cities have been growing, populations in rural areas have fallen behind, growing only 3 percent compared to urban areas' 11 percent. According to the report, from 2020 to 2030, rural areas will slow their crawl forward, increasing only 1 percent, compared with 8 percent in urban areas. The appeal and ease of city life is the main factor behind this favored growth, despite the fact that it's the rural areas that have room for expansion while urban spaces struggle to house their expanding population. While metropolitan areas house 85 percent of America's residents, rural areas sprawl over 75 percent of land in the U.S. while housing only 15 percent of the population. The study also notes that the population housed outside cities is aging faster than urbanites. Between 2000 and 2010, the percentage of the population above age 65 was about 15 percent for rural areas and 13 percent for metro areas. By 2040, 25 percent of rural households will be age 65 or older, compared with only 20 percent of urban households. Racial diversity has also lagged behind in rural areas, the study notes, and while this too is growing slowly, by 2030 rural households will only be as racially diverse as metro areas were in 1990. So how will this impact housing over the next 25 years? Demand for housing will increase (slowly) in rural areas, as people tend to live longer and find independence earlier – not living with mom and pop until age 30. And since the rural population is older, senior housing demands will increase and need to be met. For those wishing to age in place, demand will grow for retrofitting current homes and building new residencies that are more senior friendly. The study also notes that a growing percentage of working-age rural residents may need housing assistance, even if they do not qualify for it.